The 1936 Fords have always been considered a milestone design, and it in fact, it was one of their best selling model years when new. In 1936, you could still order your 1936 Ford in old-school body styles like cabriolets and sedan deliveries, and most collectors consider the 1936 models with its gentle V-shaped grille and vertical grille bars to be the best looking and most sought-after of all early V-8 Fords. 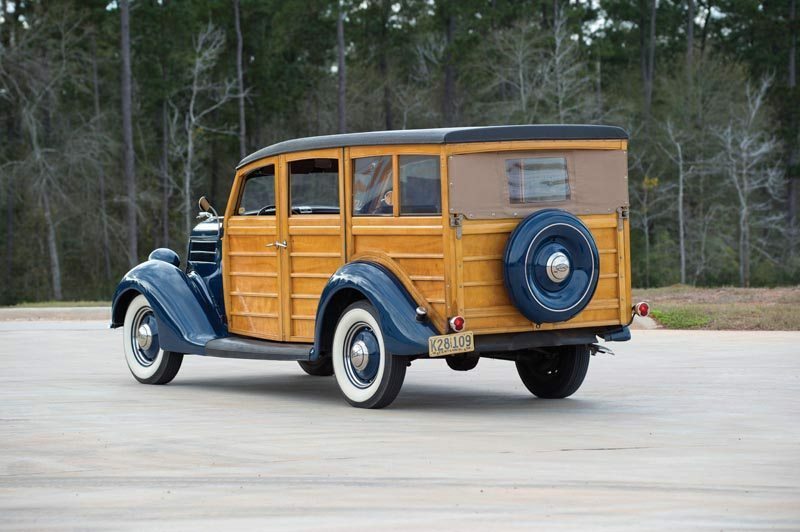 Sitting somewhere between a car and a truck, the wooden bodied Station Wagon may be the most desirable of all, with recent auction results seeming to support that conclusion. 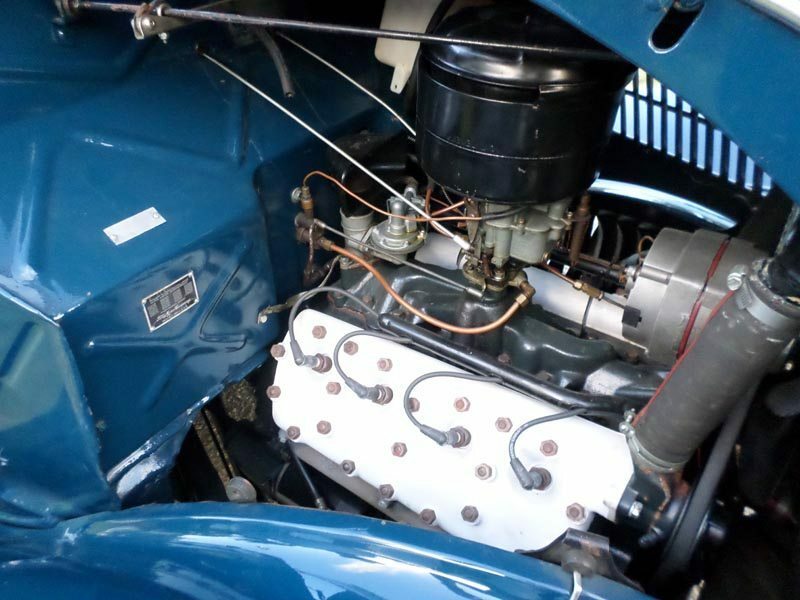 The legendary Ford “21 Stud” flathead V-8 had proven itself to be reliable, with parts and service easily obtainable. In fact, from 1932 to sometime in 1936, Ford produced three million flatties. Ford advertising of the era featured Clark Gable touting a comfortable ride, rigid X-Frame, and engine features that were superior to Chevy and Plymouth such as a stiff and lightweight crankshaft, aluminum pistons and heads, and hardened valve seats. This fine wagon was upgraded to a full 12 volt system, which all adds up to comfortable and reliable cruising and touring. Interestingly, the Station Wagon (as the woodie was officially known) used the cowl and windshield frame from the convertible. Henry Ford owned his own forests near Iron Mountain, MI, where he grew hardwoods for car bodies. Hard maple was the choice for the structures, with Henry allowing no knots in the product. 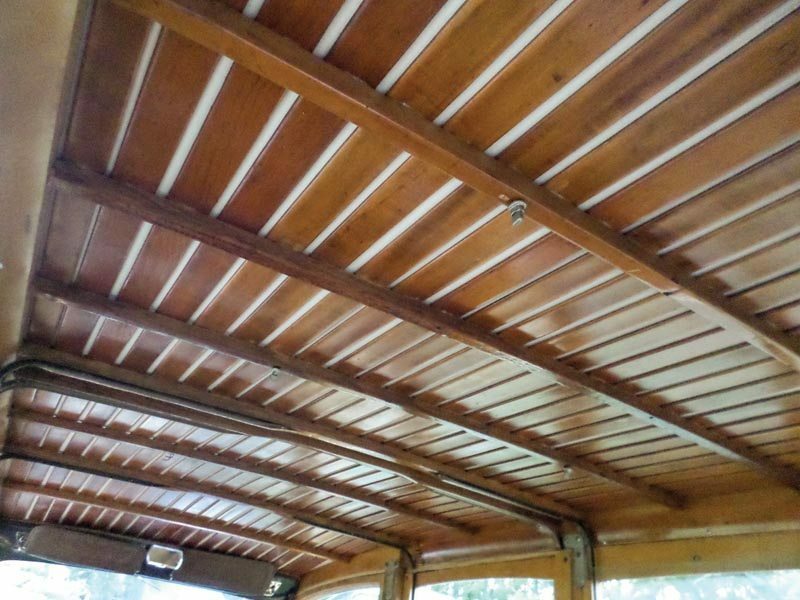 The side panels were of cross-grained exterior birch or gum plywood, and the roof slats were made of basswood. After only a few years most woodies faced a steep depreciation curve due to poor maintenance of the wooden body, and why many woodies became cheap beach transportation to a generation of surfers. Today this ensures the rarity and exclusivity of any low mileage survivors. This fun to drive 1936 Ford Station Wagon is a rare and special specimen, with less than 63,000 original miles. The wonderful interior features roll up front windows, and side curtains in the rear. Dual white wall tires with trim rings roll on the factory 16” wheels, with the spare protected by the original metal spare tire cover. 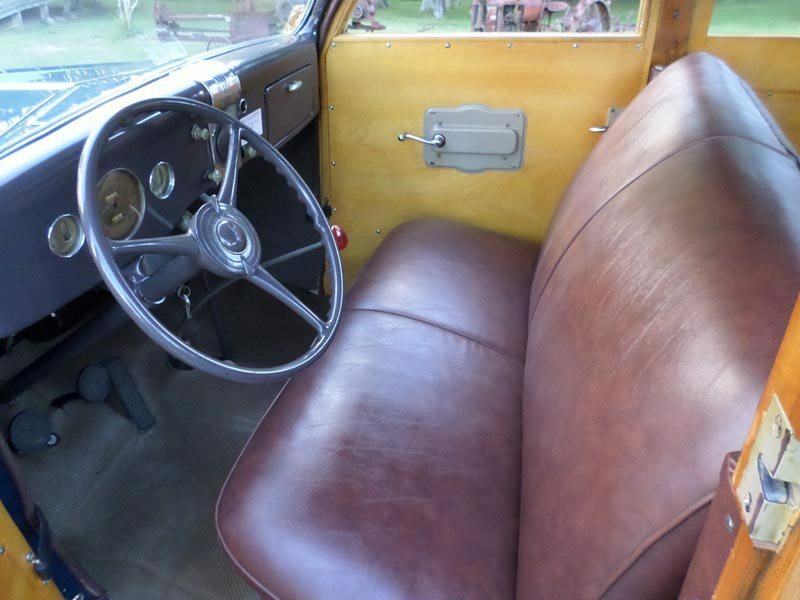 1936 Fords were also equipped with equipment such as safety glass, dual sun visors, dual taillights, and dual horns, and this wagon features the accessory Southland heater. 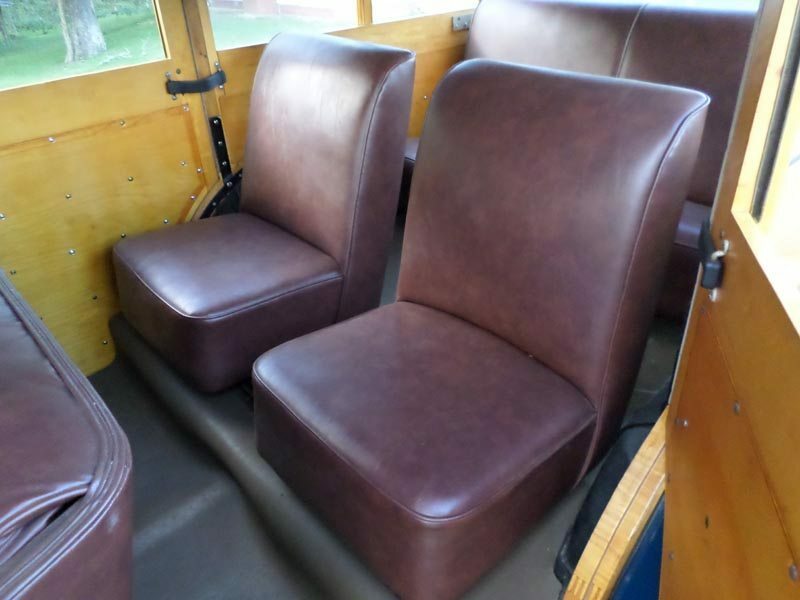 Additionally, the speedometer and gauges all function properly, and the versatile three-row seating is spectacular, making these woodies the kind of classic vehicle the whole family can enjoy. The Washington Blue exterior shines brightly, with a nice gloss, and the roof inside and out is simply gorgeous. All bright work is in excellent condition, and the freshly restored woodwork shows true craftsmanship. Both under the hood and underneath the car, the quality continues, with the iconic Ford flathead looking fresh and clean and idling smoothly. 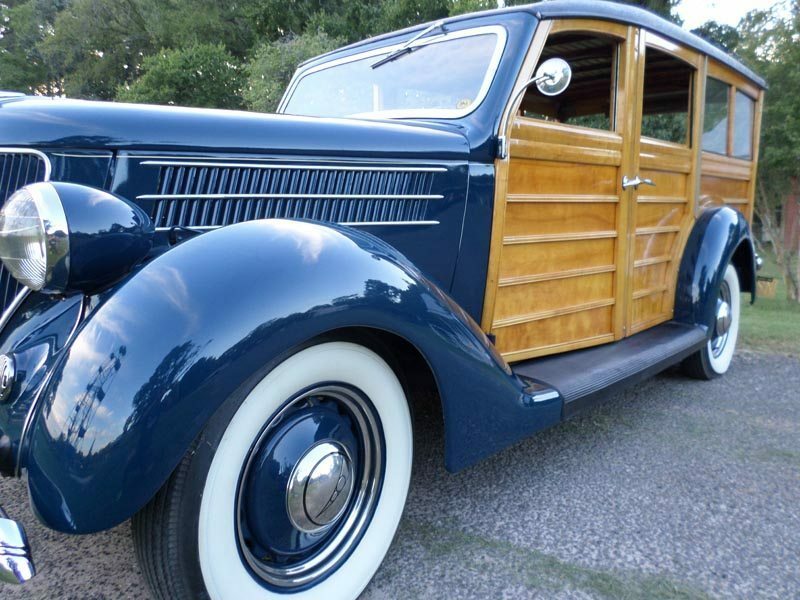 The owner reports the Woodie starts and runs with authority, and is an absolute blast to drive. Woodie owners enjoy a special place in the hobby, with the universal respect their cars are shown and the many places their vehicles can be shown. 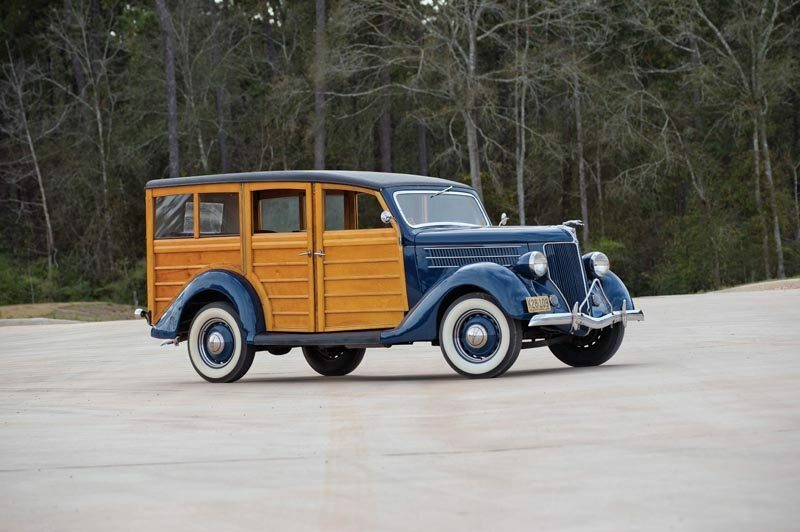 Equally at home with the Early Ford V-8 Club or the National Woodie Club, a 1936 Ford Station Wagon represents one of the fastest growing segments of the collector car hobby, and one everyone loves.